Pegboards are boards with pegs and holes , mainly used for games and organizing activities.Having a pegboard at home not only makes your room organised but also utilizes the work space. Then,how can we customize the pegboards according to the dimensions of the things we posses? If you happen to have access to a 3D printer nearby, then your job becomes easy! 3D print bins, holders, mounts and shelves ,they all can be printed and arranged on pegboard to your heart’s content to get your customized pegboard done. Matt Manhattan, a New York City native, created his own peg board with his innovative ideas. He designed his pegboard with a 3D printer. “As my understanding of design and printing grew, so did the customization of my home,” he explained. “By mounting modular pegboards throughout my home, I was able to create custom mounts for all of the little things I need in life to keep them exactly where they need to be.” said Matt Manhattan when asked about his ideas. The Manhattan Pegboard Collection consists of 5 parts ,they are- a 2-peg customized holder ; a 4-peg customization holder; 1 customized rounded holder; 1 pedestal shelf; and 1 USB cable holder that can hold up to 6 different cables. In fact, almost every room in his own house has a pegboard!. 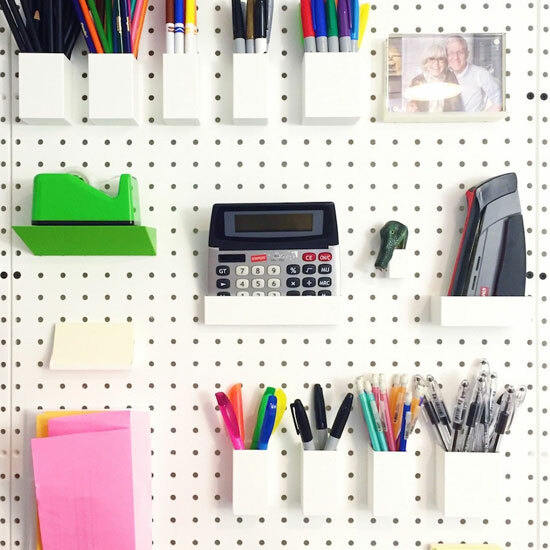 In his home office, the pegboard is filled to capacity with all kinds of office supplies, electronic gadgets, and cords galore. In his bathroom, his toiletries, toothbrushes, razors, etc. are all nicely “peg boarded” up to the wall next to the bathroom mirror. And, of course, there are the hanging pots, pans, utensils, and condiments above the stove in his kitchen, too.Shelves, bins, and holders for the pegboard can be printed in different colors for a funkier effect, or in all-white or even clear filament for a more modern and stream-lined effect. “Depending on a variety of factors your print results may vary! Some of my prints slide into the pegboard peg holes without issue, and sometimes it requires a bit of extra force. If you find that the pegs are not printing well, make sure your support structures are adequately supporting most or all of the entire peg (depending on your settings). I print my pegboard pieces using an Ultimaker 2 with an Olson Block running a 1 mm nozzle. The prints in the included photos were printed using Verbatim PLA in White. With this setup I can print durable pegboard parts at a 0.5 mm layer height and 2 mm walls with reasonable speed.” said Manhattan in his blog. This is the story of Manhattan who designed and created his own pegboard using a 3D printer.Inspired to make your own pegboard? then why delay! start your project today.